To see what he could see. We’ve all heard this particular children’s song and it’s probably playing in your head right now. I thought this headline was appropriate because our year end sales numbers graph looks like home prices went up the side of a mountain through 2005 then fell off a cliff until 2009 before rebounding the past few years. Official sales numbers were just released this past week for the state of Florida and the SW Florida real estate market. 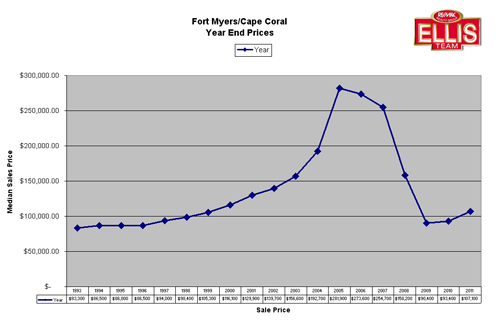 Year end sale prices were up 14.67% from $93,400 in 2010 to $107,100 in 2011 The year end graph isn’t where prices finished the year but rather an average of what they were all year long. 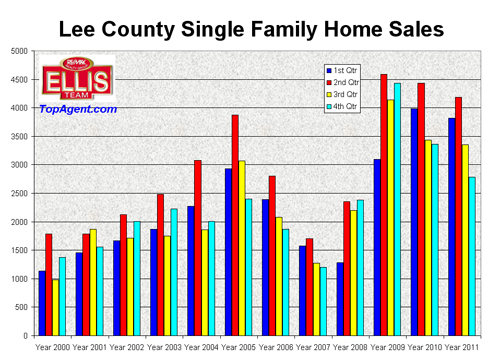 For instance, November median single family home prices in Lee County was $106,300 and December’s was $123,400, a whopping 16.09% jump over the previous month and a 36.05% jump over year ago December figures. 2011 was the 3rd best year on record for numbers of sales. Inventory declined throughout the first 3 quarters of 2011 or we very well could have sold many more. To put things in perspective, 2011 outsold 2005 by almost 2,000 homes. Everyone speaks about 2005 being the height of the market, but it is the 4th best year on record in terms of units sold. 2009, 2010, 2011 respectively were 1-3. While prices rise it’s quite natural volume will go down. It’s simple supply and demand. If we had more inventory than our market could handle, our prices would be lower and not rising. It’s always difficult to predict a top or bottom, but hindsight always provides crystal clear clarity. The reason is you can have a false bottom whereby prices bounce back for a few months only to retreat again later. On Wall Street it’s termed a dead cat bounce when the market does that. With several years in the books it appears we can safely say the market bottomed in 2009. If the market would go lower in the future it would be a new market, not a continuing drop. We don’t see the market going lower year over year going forward; although monthly price swings are not out of the question as closings are dependant on what inventory there is and what’s actually closing in a given month. We have no problem listing and selling properties. The skill is really getting them closed today. The regulatory and operating environment has never been so tricky as there are so many new regulations pertaining to new mortgages. If the lenders initial disclosure is off by a little bit, it requires by law to re-disclose everything and a new waiting period goes into effect. Combine new lending rules with negotiations with HOA’s and condo association over fees, title issues, appraisal issues, inspection issues, and challenges with short sales and you can quickly see nobody can guarantee closing dates, and scheduled closings in one month can easily pop over into subsequent months. All these challenges affect the real estate market and can push high end or low end closings from one month to another, ultimately effecting month end numbers. In the end, these numbers all work out in the wash, so we like to look at year end numbers or a moving average throughout the year. So many people focus on one point in time when the market is always in flux and needs constant attention to understand what’s going on. That’s what we’re here for, to keep you updated with unbiased information good or bad. We’re in the midst of season, and as predicted season started early and seems to be going well. I guess we’ll know in April or May for sure. In the meantime, stay tuned. Posted in Southwest Florida Real Estate.Tagged Cape Coral real estate, Ellis Team at RE/MAX, Florida real estate, Fort Myers real estate market, Lee County Florida, Lee County Single Family Home Sales.